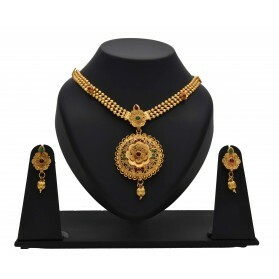 Gold plated Peacock Meenakari bridal long necklace set makes you stylish on wedding and engagement occasions. 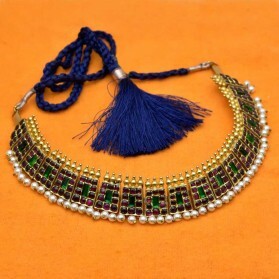 Enamel worked beads hanging at the bottom of the chain gives a trendy look. This traditional designer bridal wear will attract people with its magnificent artwork. 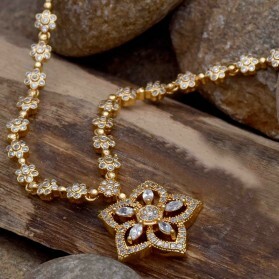 This beautiful long chain necklace with matching ear drops is liked by women of all age. By buying this product you can collect up to 134 loyalty points. 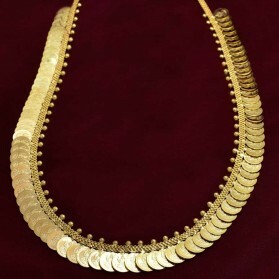 Your cart will total 134 points that can be converted into a voucher of ₹ 26.80.